The Los Padres Council Executive Board and Key Three would like to thank you for all your efforts to bring the benefits of the Boy Scouts of America program to the youth in your communities. We know you share our commitment to make the Boy Scouts of America the premier youth serving organization in the Nation. There is no more important responsibility in the Scouting Program than the protection of all our youth members followed by providing our youth with a quality program. Experience has proven the best way to accomplish this is to provide effective training on a continuing basis to all adults involved in Scouting at every level with no exceptions. Only when everyone is involved and trained will we have achieved the safe and rewarding Scouting experience our youth deserve. Youth Protection Training is required annually as now mandated by the National BSA for all registered leaders. Leaders who do not have YPT for the current year cannot be registered when their unit re-charters. The unit may not qualify for re-charter if an essential leader does not have YPT for the current year. All Direct Contact Leaders* MUST complete their required position specific Basic Training courses by Dec. 1st. *( These leaders are Cubmasters & Asst. Cubmasters, Den Leaders & Asst. Den leaders, Scoutmasters & Asst. Scoutmasters, Varsity Team Coaches & Asst. Coaches, Venture Crew Advisors & Asst. Advisors). New Merit Badge Counselors must complete their training course by March 31 (their annual registration date) to remain counselors. They also have to retake Youth Protection annually. Scoutmasters should only refer Scouts to merit badge counselors who are on the council list of trained counselors. Indirect Contact leaders must complete their position basic training by December 1st in order to be registered when their unit re-charters. These basic training courses are online at my.Scouting.org . New leaders registering AFTER Oct. 1st have until Dec. 31st of the NEXT year to complete training. All waivers must be approved by the Council Commissioner. We realize that these policy changes may appear to create more work for already busy volunteers but there is nothing more important than protecting the youth in our program and providing them with the best program possible. We firmly believe we can best deliver the promise of Scouting through 100% trained leaders. The district and council training committees are working to schedule frequent training courses to allow you to meet these new requirements and goals. If you have not completed your required position specific training, please begin now and don't wait until December. Download copy of the Training Matrix below. 1. Why is the Council requiring annual Youth Protection Training ? The Western Region of BSA, which we are part of, announced that effective May 1, 2015 annual Youth Protection Training would be required for re-chartering of all volunteers and professional Scouters. We wholeheartedly accept and agree with this policy change. There is nothing more important than protecting the youth who participate in our programs. 2. I’ve been in Scouting since I was a youth, why do I need to go to training? I could probably teach the course. Many of our Scouters have years of experience and we value their knowledge. We invite them to join our training teams. Unfortunately, over half of the direct contact leaders in the council have not completed their required position training. Requiring 100% trained leaders is the best way to achieve the highest quality program and Scouting experience which our youth deserve. Additionally, from a risk management standpoint, given the nature of what we do in Scouting and the outdoor environment in which we take both our youth members and our adult volunteers, documented trained leaders are absolutely necessary in order to protect our volunteers, the Los Padres Council and the Boy Scouts of America from exposure to unwarranted legal liability actions. 3. I took training years ago but it doesn’t show on my record. Do I have to take it again? Over the years training courses and their names have changed. If you have a training certificate or other information about the training you had such as year, name of the course, place and instructor, you could be given credit for the course. Contact your District Training Chair, the Council Training Chair or your Unit Commissioner. 4. How will I know if I need to do training and which courses to take? Your Unit Commissioner and District Training Chair will work together to give a training report to your unit committee chair who will let you know what training you need to complete. Some courses are available online at MyScouting.org where you took your Youth Protection Training and others are “live” courses. Consult the council website for the latest information on training courses or contact your District Training Chair. 5. What if I can’t attend the training course I need to be “Trained”. The council and districts will be providing training courses multiple times throughout the year. As mentioned above, several of the courses are available online in your “Legacy Account” where you took your online Youth Protection Training (MyScouting.org). In some cases, you can request your District Training Team to bring the necessary training directly to your unit. You will have ample opportunities to complete your training requirements and you can take the training in any district or council. Summer camps often offer required training as well. If you take training at a summer camp or out of council, be sure to send a copy of your training certificate to Zea Bauer, the Council Registrar, to update your records. 6. Who are Direct Contact Leaders? Direct Contact Leaders are those who have face to face interactions with youth. They include Cubmasters, Asst. Cubmasters, Den Leaders, Asst. Den Leaders, Scoutmasters, Asst. Scoutmasters, Varsity Team Coaches & Asst. Coaches, Venture Crew Advisors and Asst. Advisors, and Sea Scout Advisors. 7. Do Indirect Contact Leaders need training too? Yes, all registered leaders must have the required training for their positions. We encourage all Indirect Contact Leaders to complete their training as soon as possible, most of which is available online at myScouting.org, but they are allowed until Dec. 31, 2016 to complete it. 8. I’m currently trained as a Webelos Den Leader but plan on registering as an Asst. Scoutmaster when my son joins a troop. Do I have to complete all of my new training by the end of the year? Not necessarily. Any leader who registers after Oct. 1st has until Dec. 31st of the following year to complete the required training. We encourage those leaders to do the online “Joining” and “Orientation” training and complete the required training courses as soon as possible. If you change positions prior to Oct. 1st you must complete the basic training requirements before December 31st of the same year (preferably before your troop re-charters at the end of that year). If there are extenuating circumstances, the Council Commissioner can authorize a reasonable extension to the stated deadline. A leader who assumes a position that also requires Introduction to Outdoor Leadership Skills (IOLS) has until December 31st of the year immediately following the year he/she assumed the new position to complete IOLS. 9. What will happen if a leader doesn’t complete the required training by the deadline? That leader will be dropped from the unit re-charter. If the leader holds a required position within the unit, i.e. a Scoutmaster or Committee Chair, the unit will not be able to re-charter. The best options include: 1) the leader completes the required training by December 31st, or 2) a leader who is fully trained for the position assumes the position for the leader who has not completed the training requirements. The re-chartering process must be completed by December 31st in order for the unit and its members to stay registered in the Boy Scouts of America. After that date, the unit and its members are no longer registered in the Boy Scouts of America until such time as the unit completes the re-charter process. Given this, no renewal of the unit’s charter should be held up past December 31st as a result of a leader failing to complete the training requirements for their position. 10. Whose responsibility is it to keep track of training records and make sure all training is completed and up to date? Ultimately, it’s up to the unit Key 3 and the individual leader to be responsible for tracking required training and making sure that Youth Protection Training is updated annually. Unit Commissioners and District Training Chairs can access online training records to assist in this. Official training record validation is located in the Training Manager in my.Scouting.org, and each unit should have a designated member of the unit committee (Training Coordinator), whose responsibility it is to keep the records up to date. As an individual volunteer, you can access your entire training record in your “Legacy Account” in MyScouting.org where you took your Youth Protection Training. In doing so, make sure you have linked your account to your membership number (located on your membership card) and to the Los Padres Council (#53–Santa Barbara). If courses are missing from your training record, follow-up as was discussed under question no. 3, above. 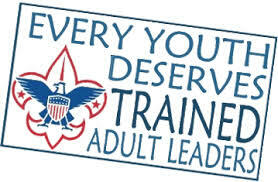 Remember, EVERY SCOUT DESERVES A TRAINED LEADER!